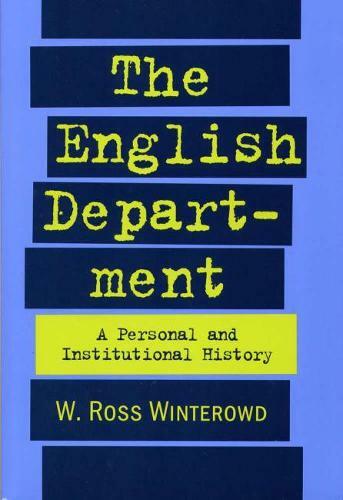 To understand the history of "English," Ross Winterowd insists, one must understand how literary studies, composition-rhetoric studies, and influential textbooks interrelate. Stressing the interrelationship among these three forces, Winterowd presents a history of English studies in the university since the Enlightenment. Winterowd' s history is unique in three ways. First, it tells the whole story of English studies: it does not separate the history of literary studies from that of composition-rhetoric studies, nor can it if it is going to be an authentic history. Second, it traces the massive influence on English studies exerted by textbooks such as Adventures in Literature, Understanding Poetry, English in Action, and the Harbrace College Handbook. Finally, Winterowd himself is very much a part of the story, a partisan with more than forty years of service to the discipline, not simply a disinterested scholar searching for the truth. After demonstrating that literary studies and literary scholars are products of Romantic epistemology and values, Winterowd further invites controversy by reinterpreting the Romantic legacy inherited by English departments. His reinterpretation of major literary figures and theory, too, invites discussion, possibly argument. And by directly contradicting current histories of composition-rhetoric that allow for no points of contact with literature, Winterowd intensifies the argument by explaining the development of composition-rhetoric from the standpoint of literature and literary theory.